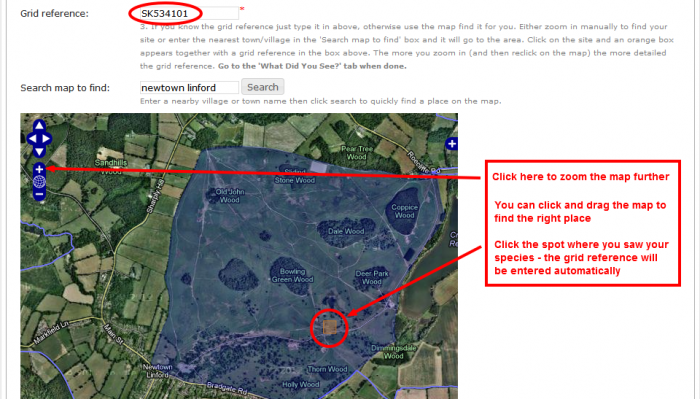 This page describes how to use the Submit Record form to send in your wildlife sightings and/or images. The Submit Records form is quick and easy to use. It is intended to record one or more species (with or without images) seen at a given site on a particular date. If you want to submit wildlife records from more than one site or date, complete a fresh form for each one. You must register before you can submit a record or image. This is free and will only take a few moments, though you may have to wait for admin approval. There are just three things that are essential to record on the form: 1. when you saw it (date) 2. where you saw it (grid referenceand 3. what you saw (species). These are called required fields and you can't save the record until all three are filled in. (The fourth essential is who saw it - but we know that from your log in). If you forget any of these, you will be prompted to fill in the missing information. All the other boxes are optional but give you the chance to tell us a bit more about your sighting. Follow this six step guide to submitting your wildlife sightings. If this is all new to you, try opening a second tab on your browser to have the form and this guide open at the same time. You must enter the date for the record to be valid. Click into the date box and the date picker appears to make this very easy. If you want to type in the date you can (eg. 25/04/2011). Remember, you must use a new form if your wildlife sightings were on different dates. Enter the site name as Place name first, then details, e.g. "Melton Mowbray, Scalford Road". 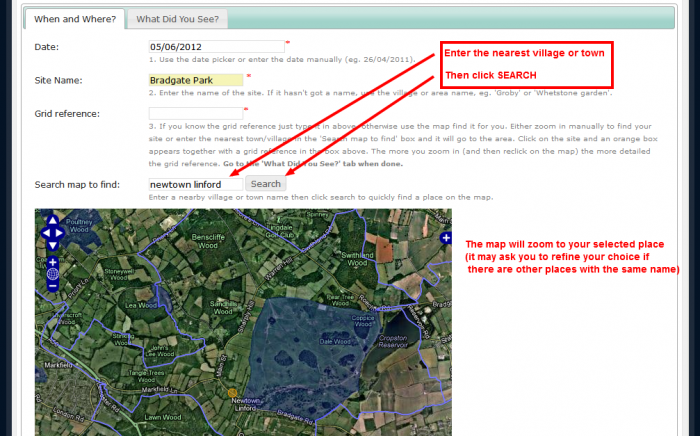 If the site doesn't have an established name, enter the nearest town or village before any description, e.g. "Groby, Main Street" or "Whetstone garden". Don't panic! The site makes this very easy - all you have to do is click the 'spot' on the map. You must provide at least a 6 number grid reference (locating a 100m square). Only records with 6 number grid references are included in our Wild Places species lists and on the species distribution maps. For gardens, an eight figure grid reference is best. The specific grid references for some sensitive species, such as Badgers, are automatically masked. If you are concerned about revealing the location of a sensitive species then email us (info@naturespot.org.uk) and we can mask the location for you. Now use the map controls to find the exact spot - then just click on it and the grid ref will be entered automatically. Make sure your grid reference has at least 6 numbers. If it only has 4, zoom in further and click again. To start, type the first letter of your species in the species box and a list of possibilities will appear in the menu. Typing more letters will narrow down the list. A little patience may be needed so don't type too quickly - the list should first appear after 3-4 letters are entered. Keep typing to narrow down the list. When you see the species name you want, click on it (don't try and type in the full species name - you must select from the list). The list includes both the scientific name AND the common name (if it has one) so you can search for either. The other boxes on the row are optional, but if 'Recording Advice' pops up on the form below your species row then use the comments box to provide the requested evidence. ABUNDANCE: This is an optional field where you can tell us how many of each species you saw (in numbers or words). The default setting is one so if you don’t change it we will assume you have seen just one specimen. CONFIDENCE: Sometimes you may think you know what species you have seen but are not 100% certain. You can then enter Likely or Maybe from the drop down menu, depending how confident you are about the identification. If you have an image with your record, we may be able to help confirm the identity. If you are sure about the identification, then leave the entry as Certain - the default setting. IDENTIFIED BY: It is helpful to know if an expert has helped to confirm the identity of your species. For common species this isn't important and you can leave it blank. In any case, if you leave it blank we will assume you identified it yourself. COMMENTS: This is the place leave any additional information and to provide any details requested by the 'Recording Advice' pop up. 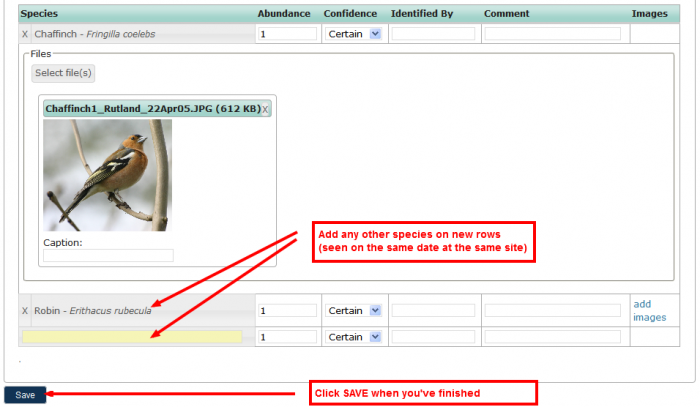 Note - the Add Images link only appears after the species name has been entered. Click on Add Images if you have a photo to attach to your record. You can add up to four images. The system can accept any images up to 10MB in size and will resize these to a smaller version. Add up to three more images, particularly if these show ID features relevant to your species. For each uploaded image, you have the opportunity to add a caption. This caption will be displayed with the image but should only be used to point out anything of note in the image itself. Image caption entries are not saved as part of the record. Use new lines to add any other species you saw. Note - species seen on a different date or at a different sites should be entered on a fresh form. You will now be taken to a thank you screen listing your records. All uploaded images will be displayed on our Latest Images page (once the record is accepted). Your image(s) can also be seen on the My Images page. After submitting your record(s) you can return to edit an entry at any time. See Editing your records. You can choose how much feedback you want to receive after you have submitted a record. See the notifications page for options.